It's taken a while but it looks like Commissioner Keon Hardemon has worked his way up to the top of the batting order on the Crespogram. 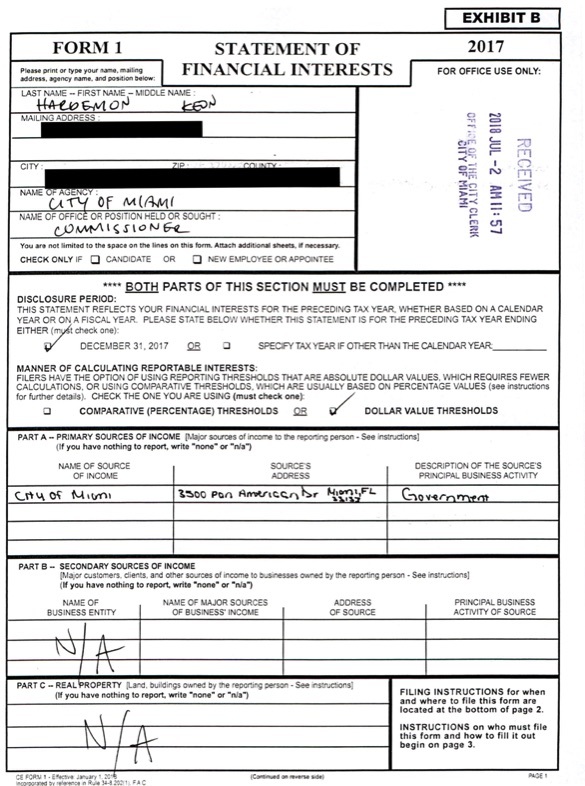 Yesterday I included him in a story about the non-existent accountability that exists in the various financial forms that public officials in Miami are required to fill out annually, and as an example, I pointed out that the Commissioner had failed to include his law practice in his financial report as a source of either primary or secondary income. Although the commissioner reported owning $250,000 in real property on his Public Disclosure Of Financial Interests, he failed to included that information in Part C: Real Property of his FORM 1. As sometimes happens when I dash off a story, there was a lot more that I coulda, shoulda spent time on before posting the story, but I've been working on several long, detailed stories that I keep trying to get finished, and so even though I didn't do as complete a job of research as I should have, thankfully, I have readers who are smart, knowledgable, and willing to pick up the slack, and one of them called me up to tell me all the things I should have followed up in the reports before posting my story. One rule of thumb I've come to rely on in writing about the public officials in the City of Miami is that if what should look simple looks confusing, then odds are that there are squirrels loose in the house. 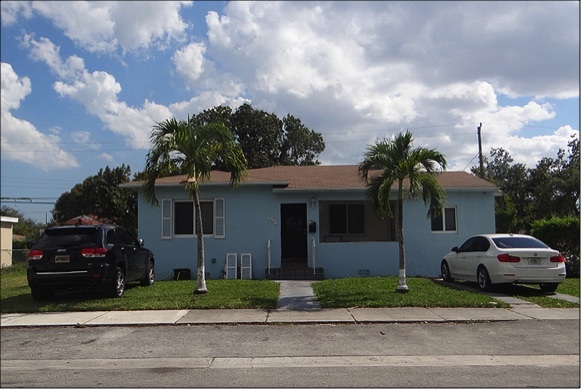 Below is the house in Liberty City that Hardemon listed on his corporate documents as the address for his law firm. Here is the corporate listing, and you see that it is up to date, having been renewed in 2018. If this were Keon Hardemon's house, he would be able to operate a home office from this property. 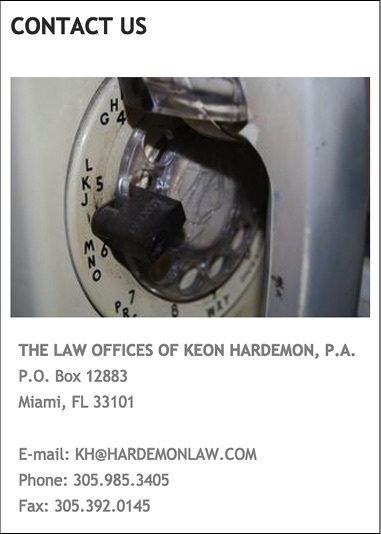 However, all available records indicate that this is not Keon's house or his place of residence, but rather his mother's house. 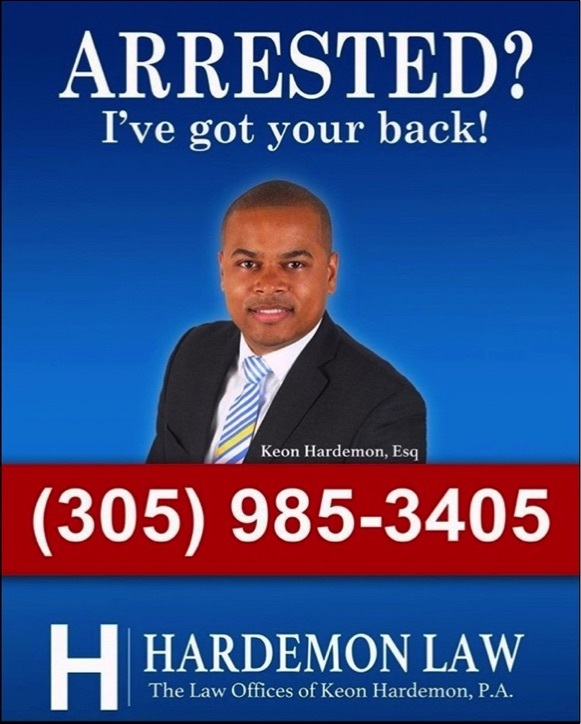 It turns out that where Keon Hardemon lives is a secret, because as a result of a legislative exemption, current or former public defenders are allowed to hide where they live. The question here though, is not so much a question of where Hardemon lives, but of where he maintains a law office, or if he is still a practicing attorney. 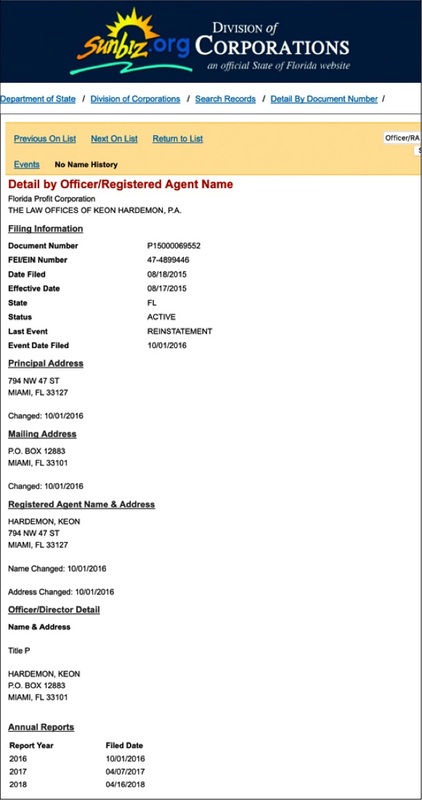 According to his website, the commissioner claims that he can be reached via a PO Box at the Post Office across the street from the Miami Police Department headquarters on NW 5th Street. So, since he doesn't have a BTR, he doesn't seem to have a real office, and the only address that is on record for his law practice, seems to be his mother's house then what's up? 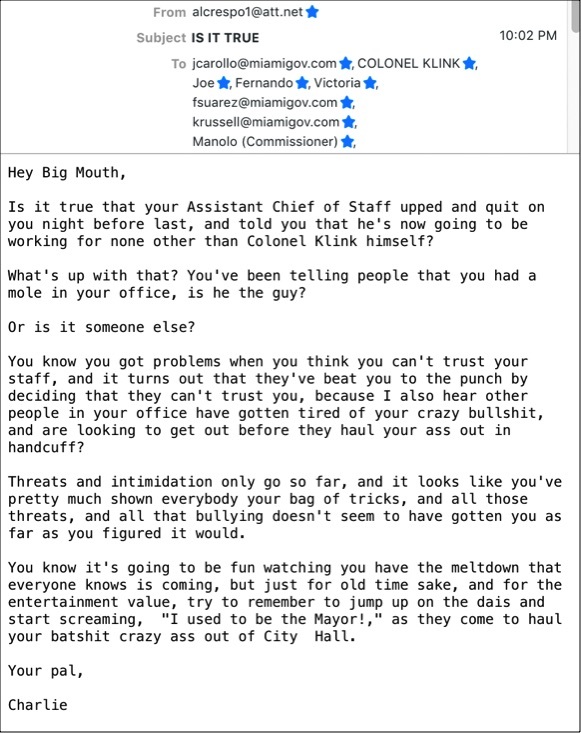 I tried to get an answer to that question by sending the Commissioner an email asking him to confirm or deny he's practicing law. He did not respond prior to the end of my deadline. But if he's practicing law, and if he made any money doing so in 2017, he failed to include this information on his annual financial report. 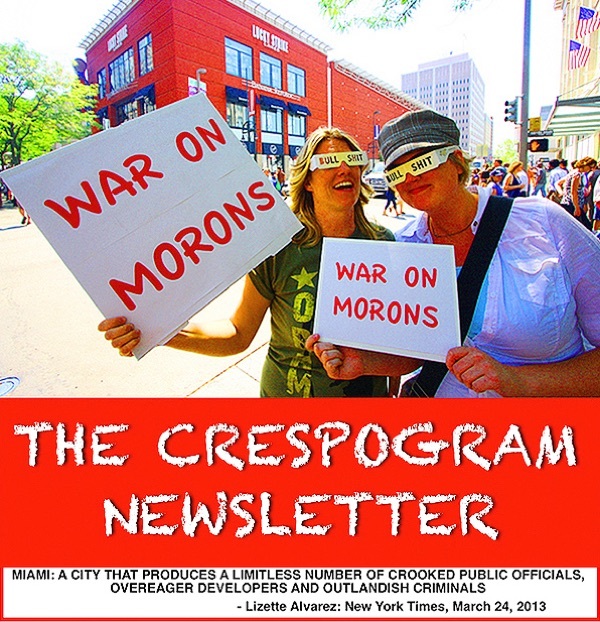 And all of this has happened while he was the Chairman of the Miami City Commission where he made a habit of pontificating over the need of folks doing the right thing.